The first violin part for Beethoven's Symphony No. 5 in C minor, Op. 67 has been edited by Ilya Kaler, who has appeared as guest concertmaster with the San Francisco Symphony, Philadelphia Orchestra and Baltimore Symphony. Kaler's bowings, fingerings and other editorial markings have been added throughout the score. Symphony No. 5 by Beethoven is one of the most famous compositions in classical music. It premiered in concert along with the Sixth Symphony in 1808. The first movement is defined largely by its famous four-note motif, which is known worldwide. The motif frequently appears in popular culture – from disco to rock and roll, to appearances in film and television. This is followed by a lyrical slow movement and a scherzo & trio, before concluding with the triumphant finale, an unusual variant of sonata form. Download and print the score today to gain access to expertly edited Beethoven Symphony No. 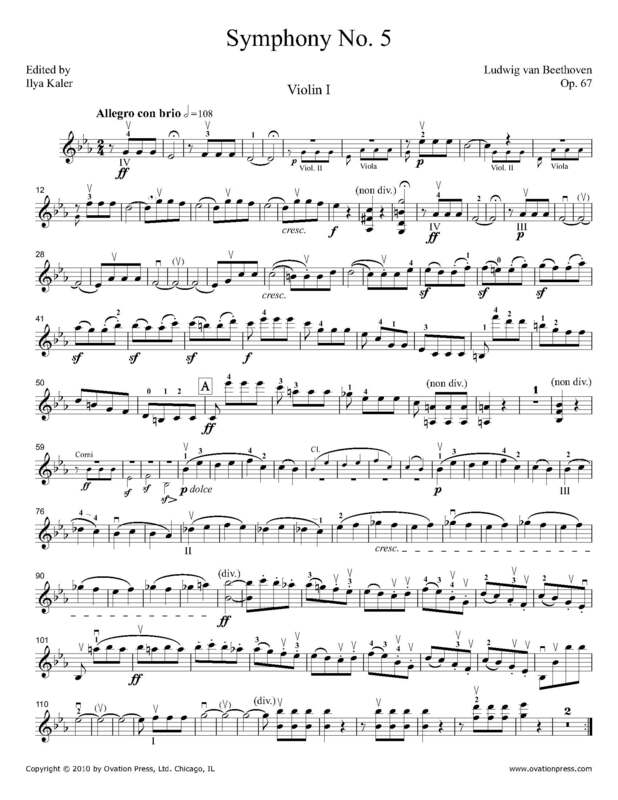 5 violin fingerings and bowings from Ilya Kaler!